Over the last year we have been speaking at many of the International Association for Near Death Studies (IANDS) groups sharing what we have seen on the other side and what we have witnessed through the experiences of our clients. 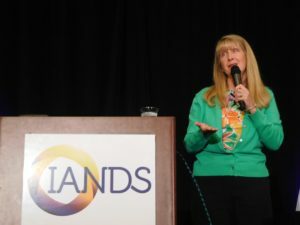 In August 2017, Anne spoke at the IANDS national conference about After Death Communication. After the talk we gave one Sunday to the IANDS group in Boulder Colorado, Anne went outside the lecture room to say goodbye to the guests. As she sat down on the bench by the door, a dime fell through the air, hit the toe of her shoe and clinked on the pavement. It came from absolutely nowhere. She then remembered that one of the attendees, Allan, had asked us to communicate with his diseased wife. He said she would throw him dimes from the Other Side to get his attention. He wanted to know how she was doing, and we found her to be very loving and kind. Through Anne they chatted for a while, and this was a very tender experience. Talking with the Other Side is always fun and enlightening in unique ways!